We crossed from the Grand Canal to the Royal Canal, which involved cruising through the expansive Grand Canal Dock basin, crossing the Liffey at low tide, entering the narrow channel entrance into the Royal Canal, under the low bridge there, and finding a place to moor along this first part of the Royal Canal. From here we will be ready for cruising under the raised railway bridge tomorrow. 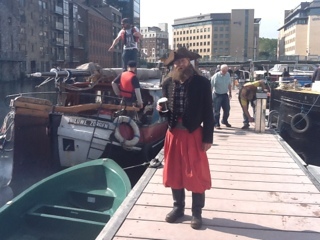 We are currently joined by a flotilla of around 20 boats, most of them being veteran heritage barge boats, all heading in the same direction. 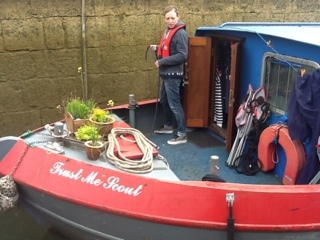 Being at the start of the Royal Canal this will also be the start of retracing John Roche's most detailed portion of his journal from his boat log. We look forward to seeing how our journey will compare. I look forward to aligning his notes to mine, again. 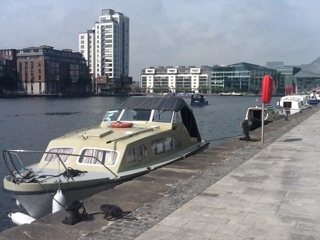 10:40 am, we headed around the Grand Canal Dock basin towards the sea lock. Lots of sporting action here as the day was still warm and quite summery. There are some wind surfers being trained as well as some rowing teams. Almost all of these sports people are women. There are also frequent dives from the road and paddling by the bright yellow aqua road vehicles from the Viking Splash company full of passengers wearing horned hats. I was amazed how frequent and popular this entertaining tour is, a full aqua road vehicle with 20 to 30 people aboard every 10 to 15 minutes. 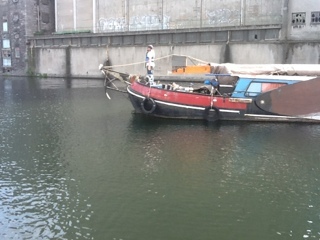 11:00 am, waiting our turn to enter the sea lock between the Grand Canal and the Liffey River. Quite a tricky manoevre as we dodged the wind surfers, rowers, Viking splash vehicles and our fellow flotilla members. 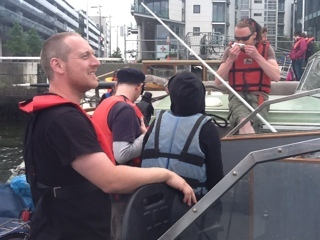 There was a tingling of excitedment when we were finally tucked up into the lock with 5 other boats facing the wild open Liffey River that were were about to be cast adrift into. 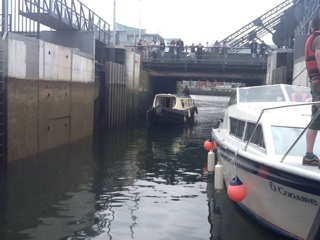 1:00 pm, everyone was moored outside the Ferryman pub, beside the Liffey, waiting for the lock keeper. Here we are, all 20 boats huddled up side by side just before the white modern ornate Samual Beckett bridge and instantly a nautical party broke out, guitars and banjos and a rollocking chorus of Sally Brown sea shanty followed by some stunning singing by a couple of the women here in chorus. Shame this only lasted about 30 minutes, before the lock keeper beckoned us to cross the Liffey and get into the Royal Canal. I do have some video clips of the music and singing to post though. 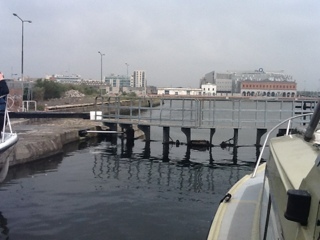 1:40 pm we are in the sea lock that will transport us into the Royal Canal. Six of us huddled into the lock again, but three were long thick iron barges that with a slightest swipe could crush us like an empty toothpaste tube. Pole and my walking stick were at the ready to shoo them away if they tried. 2:10 pm we are moored in Sprencer Dock waiting for the other boats to arrive through the lock. 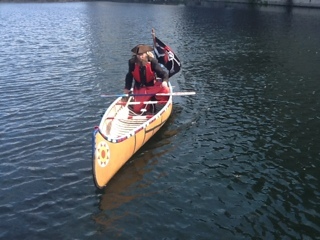 By 4 pm all 20 boats had passed through and survived the Liffey crossing but had now entered the Spencer Dock Colliseum. On this side of town there is a lot of semi hi-rise low cost housing, a little bit South Chicago. Here, several fit, energetic and excitable boys live, all wearing wet suits. This is their play pool, and we were invading! Actually, they seemed to love this new excitement in their day, but I had an instictive "on guard", all senses alert, as they were like jumping seals jumping in the water around us, leaping up hull ladders, running around the edges of boats, and jumping back in the water again. At present, it seems like this rain will get more intense and will last through to noon tomorrow. We have been warned to watch for flash flooding on boats as some showers could be deluges. Winds are said to reach gusts of 30 to 40 knots from near midnight until mid morning tomorrow, so we also have to keep an eye on how that may affect us.